If you travel about 30 miles northwest of Philadelphia, you’ll come across a picturesque borough called Lansdale. With a population of 16,000+ residents, there have been big changes to the area over the course of the last two centuries. Lansdale was first settled by the Jenkins family in the early 19th century, and while traditions of the time should have led to the area being called “Jenkintown”, the influence of the railroad would change the course of history for this small borough in PA. The mid-18th century saw an explosion of growth in the railroad industry, and it was this growth that led to putting Lansdale on the map—literally! Railroad expansion brought travelers, settlers, and businesses to the area. By 1872, Lansdale Borough was incorporated and named after Phillip Lansdale Fox, the chief surveyor of the North Penn Railroad. 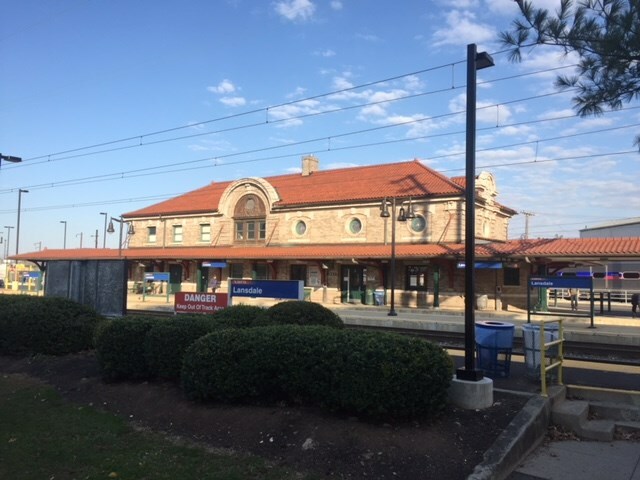 Due to Lansdale’s strategic location, the Philadelphia and Reading Railroad built a brand-new passenger station here in 1903, and this station became the jewel of the town. By making Lansdale a hub of commerce and travel, businesses grew, and the town grew right along with it. However, when the boom of the railroad industry began to fade by the 1930s, Lansdale was at a crossroads. By reinventing itself as a historic community that looks towards the future, the area was able to continue to evolve despite having the railroad station closed for good in the 1970s. Today, history is alive and well in Lansdale! The Lansdale Historic Society purchased the old railroad station in 2016 with plans to restore the building and protect the legacy of the borough. The two-building complex of the Historical Society is located on the original Jenkins Homestead, and portions of this homestead have been restored to offer public tours. First Fridays: From early May through December’s Tree-Lighting Ceremony, the community hosts First Fridays that feature a different theme each week, bands, food, and family friendly entertainment. International Spring Festival: Every year in April, North Penn High School hosts the Lansdale International Spring Festival. As the largest diversity event in the state, this festival has gone on for the last 25+ years to showcase international food, music, and entertainment. Founders Day: As one of the town’s biggest annual happenings, Founders Day occurs in August and has something for everyone to enjoy. From the farmer’s market and Festival of the Arts to vintage car parades and fireworks, the community comes alive at this event. Lansdale Bike Night: The AMA calls Lansdale Bike Night one of the largest one-night bike events in the country, and bikers from several states travel to the area to take part in a motorcycle show, musical entertainment, and socializing. At O’Brien’s Moving & Storage, we are a local Lansdale moving company that has been part of the community for decades. We understand the unique appeal that makes Lansdale one of the top places in Montgomery County to call home, and we’re here to ensure that you get the personalized, caring support you need when relocating your family in or out of the area. By offering full-service moving solutions as an Allied Van Lines agent, our Lansdale movers provide courteous and timely services to get you safely settled in your next home—wherever you need to go. When you’re looking for movers Lansdale, PA residents trust, O’Brien’s Moving & Storage has got you covered. Learn more about what the area offers and how we can provide you with the moving and storage support you need by calling today. To get started now, fill out our online form to request a free, in-home quote!